Jesus revealed himself to a young, brash, Pakistani Muslim. But he didn’t just reveal himself; he turned Naeem Fazal’s world upside down. In this riveting memoir, Fazal describes how God used extraordinary means to bring a young, underachieving, Muslim immigrant through Desert Storm, across the oceans, into college, and ultimately to pastor a Christian church in North Carolina. He demonstrates that no character flaw, no distance, no cultural chasm is too great for Jesus to reach across. Whether you are a Muslim, Christian, or neither, Ex-Muslim makes a compelling case that life with Jesus Christ is a true adventure. Naeem Fazal, a Pakistani, was born and raised as a Muslim in Kuwait. He came to the United States shortly after the Gulf War of 1990. In 1992, he had a supernatural experience with Jesus that changed the course of his life. In 2006, he planted Mosaic Church in Charlotte, North Carolina. He is also the cofounder of Charlotte’s citywide outreach initiative, What If Everyone. 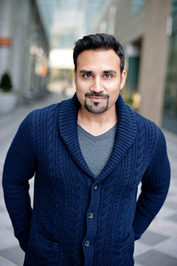 Naeem has been featured in several magazines and on Christian networks. He often speaks at conferences and churches. I received a complimentary copy of this book from Book Look Bloggers. Cassandra's Review- Bare witness to the journey that this author has taken. It is a real page turner and will have you thinking long after you finish the last one. I would say that this book is more for adults. Not because it is bad in anyway but children just do not relate to certain issues at a younger age. The words that are written in each chapter will grip your heart. What a great story of how Jesus is changing one man's life and impacting others around him.